Kitchen/Dining/Living: Villa Rosetta offers a brand new state of the art kitchen with granite countertops, stainless steel appliances, and all the comforts of your own kitchen. You will find everything you (or your private chef) needs to create incredible tropical meals. The outdoor gas BBQ is perfect for grilling the catch of the day or select cuts from the local butcher. Our indoor/outdoor living-room/dining-room allows guests to be comfortable no matter what the temperature is outside. Terrace/Pool: From the terrace and in the pool, guests can gaze across palm trees, the village of Sayulita, and glimpses of the Pacific Ocean. There is plenty of room and lounge chairs for everyone. The kitchen just a few steps away. The pool has a special shallow lounging area (6 inches) that is perfect for kids or reading a book. *1BR/1BA apt also available. For our renters, Villa Rosetta also offers a complete 1BR/1BA spacious apartment just below the house with full kitchen and private terrace. One king bed or two twin beds available. The Roof Top Terrace: This area is perfect for morning coffee, yoga sessions, afternoon margaritas, or evening sunsets. 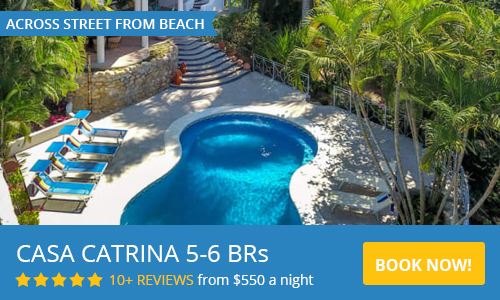 Enjoy sweeping views of the ocean, village, and jungle of Punta Sayulita. Soak in the 6-person Jacuzzi or make a drink at the bar with outdoor sink. Location: Villa Rosetta has the perfect location. No rental car needed. The villa is just over a block from the beach and two blocks to where the center of the village begins. Noise has never been an issue in the neighborhood except for an occasional rooster from time to time. What’s included: Staff service daily except for Sunday. Boogie boards. Surfboards. Beach chairs. Umbrellas. Beach coolers. Beach towels. Drinking water. Baby Equipment: Baby equipment can be rented for lighter packing. What’s extra? Meals. (Not included, but we can recommend some of our personal favorite Sayulita private chefs for cooking anything from traditional meals to gourmet experiences). Laundry. However, there are laundry services less than a block away. Villa Rosetta is truly an exceptional Villa, with an exceptional location, offering an exceptional vacation for all our guests. Guaranteed! The house was amazing and the rooms were very large. The views from the kitchen island and the living room were unbeatable. There is a table off the kitchen in a shaded area which is great to avoid the sun. If you are traveling with a group of families, the basement apartment is the secret hideaway of the villa. It was amazing with a bedroom and bathroom with shower in one room and futon, table with stove and large fridge in the main room. I would not recommend this villa if you are traveling with kids under 6 years old, as we did. A lot of shouting kids can create a loud, echo-y atmosphere. The floors can get slippery with little wet feet from the pool to the living room to the kitchen. Otherwise, this is a great spot. Older kids would be fine. The town and the beach are close and there is a lot to see and do in Sayulita. Enjoy! Came back to Sayulita after 6 years for a wedding. This was a great house to share with friends. There were 6 of us and we felt we had plenty of space without being on top of each other. There's great outdoor space for lounging and cooking on the grill and the living room doors all open up onto the patio so you get a nice breeze during the day and evening (big plus when you here in the summertime). The location is perfect, about a 5 min walk to town. No car needed and there's a few convenient stores nearby if you don't want to walk into town and need some quick necessities. I would definitely stay at this house again! The house and view is amazing!! 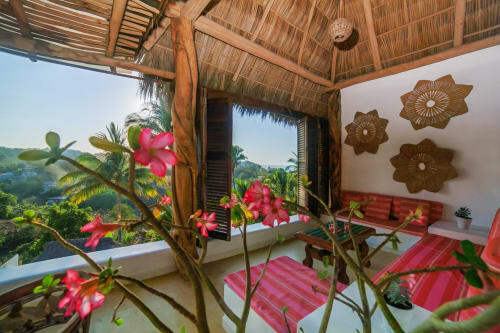 La casa esta hermosa mas de lo que uno se espera y ve en las fotos, tiene absolutamente de todo para tu uso durante los dias que pases en sayulita. super cerca del pueblo y solo dos cuadras de la playa. Me encanto, y regresare. 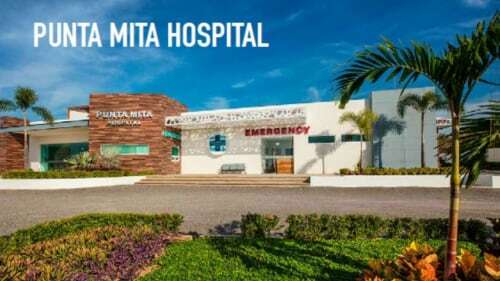 Muchas gracias a la señora que limpia a la casa, excelente persona e igualmente para Hanna y los dueños quienes estan al pendiente hasta el ultimo detalle para tu llegada. 100% recomendable, vale la pena. We just returned from an 8 day stay at the Rosetta house in Sayulita. This house is true to the description. Kerry and Ian were wonderful and helped us with some minor issues we had with the one of the safes. Everything was resolved in a matter of hours. The house itself is very well laid out. The bedrooms are comfortable, spacious and private. Awesome water pressure in the showers! We loved the pool area and the open air feel in the living room. The house sits on a corner with a slight incline. Walking up it with a bit difficult for some members in our party and we decided to get a golf cart for 3 days. For most, it shouldn't be an issue though. Our maid and maintenance crew were wonderful and greeted us everyday with a smile. We will sure miss this place we called home for the week we spent there. Thanks Kerry for letting us stay at your place! Amazing View, Perfect Layout, Beautifully Designed! I stayed in this home with my husband & baby, sister & brother-in law, and parents. The layout is perfect because we all had our own large bedrooms, in-suite bathrooms, and ocean view patios. This equates to privacy for everyone! The main floor of the home is absolutely perfect for hanging out with a group due to the open floor plan. The kitchen is open to the living room, which opens up to the pool and very large dining table outside. This home is exactly as it looks in pictures, and is a short stroll from the beach and shopping/dining in town. We also felt like it was an exceptional value! Loved staying at Villa Rosetta and you will too. 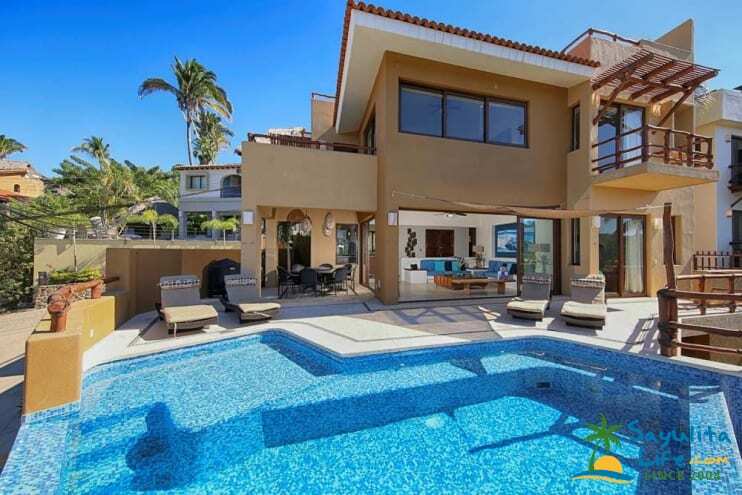 If you are looking to rent the perfect house in Sayulita look no further, you have found the one that is in the sweet spot. Not to close to the pueblo and within easy walking distance of everything. The house is exactly as shown in the pictures and you will not be disappointed. We could not have been happier with everything. Very nice house for adults or families. Perfect house to rent for a big family vacation. Eight of us visited Sayulita the first week of June, so it was Hot. The pool and air conditioned rooms made the house the perfect reprieve. At various times throughout the days, we'd end up congregating around the outside table and pool area to snack on fresh pineapple, drink beers, plan the next adventure, read, or sit quietly and enjoy the view. We loved lounging on the beach with the chairs and umbrella that are provided at the house, and the boogie boards made their way into the ocean a few times. Even on the warmest days, the walk to the house wasn't too far--the hill at the end is enough to notice but not enough to truly matter. The house is clean and beautiful; the maid came daily (even offering to come a bit later after seeing that some of us were not exactly early risers). After a couple days, it was easy to refer to Villa Rosetta as home.